War ballads emphasized courage and sacrifice while promoting the idea of a free America following the actions of tea party activists in colonial Boston. The ballad’s author compares Hale to a martyr. Hale is the victim much as all colonists are victims of the “…pale king of terrors…” The final stanza challenges King George III to, “go frighten the slave…,” referring to the king as a tyrant. Hale’s final act was to pray for his mother. Identifying the king with American slavery also figured in the initial Jeffersonian draft of the Declaration. The writer refers to the hated tea as “vile Bohea,” a term used for substandard tea. After dealing with the tea, the dissidents were urged to meet at the Green Dragon, a popular tavern in colonial Boston frequented by the Sons of Liberty. Although some ballads like Yankee Doodle and the Battle of the Kegs mocked the British, others told a story of freedom and courage. These songs became part of the independence story of a unique people. Added to a generation after the war by writers like Henry W. Longfellow and James F.Cooper, they perpetuated a drama still associated with the new birth of freedom. 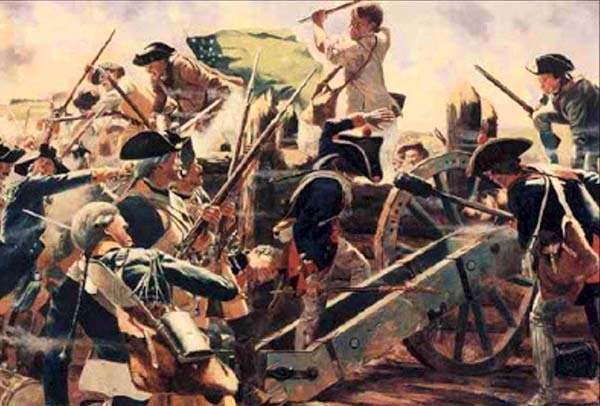 The American Revolution not only created a new nation, but rejected the old orders of Europe. Rejecting the strict social classes in England may have been related to the sympathies of the English upper classes that tended to view colonials as provincials. After 1783, this included the established Anglican Church (bishops in the House of Lords favored war, rejecting any conciliatory measures). Churchmen supporting independence included Methodists and other Protestant groups. The established, state church, however, supported Parliamentary policies.